“If we could get all of those people [who smoke] to completely switch all of their cigarettes to noncombustible cigarettes, it would be good for public health,” Mitch Zeller, director of the Food and Drug Administration's Center for Tobacco Products said today at a hearing that could help determine the fate of e-cigarettes in the United States. Among those opponents is Sen. Tom Harkin (D-Iowa), who recently put out ascathing report about e-cigarettes, and spent most of the hearing proving he knows little-to-nothing about the growing vaping movement. 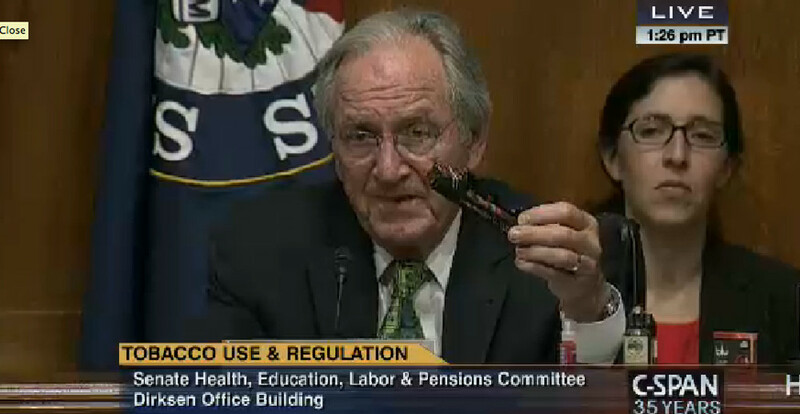 At one point, Harkin picked up a mod (and its plug, which, shockingly, is the "electronic" part) and said, "They’re buying these fancy things here. Look, it goes in the wall—it looks like a computer plug. I don’t know what that costs, but these are all geared toward young people." “We don’t think there’s any necessity to spend 5-10 years waiting to see if a 13-year old progresses from e-cigarettes to regular ones … it’s not something we need to or should fool around with,” McAfee said. "This is a huge experiment, and it’s not fair to ask kids to be the test subjects for some hypothetical benefit to adult smokers."